Celeste Ng is this year’s ambassador for Independent Bookstore Day. Independent bookstores across the land will don their party hats on the last Saturday in April for Independent Bookstore Day, which celebrates the beating pulse and personality of indie bookshops all over. 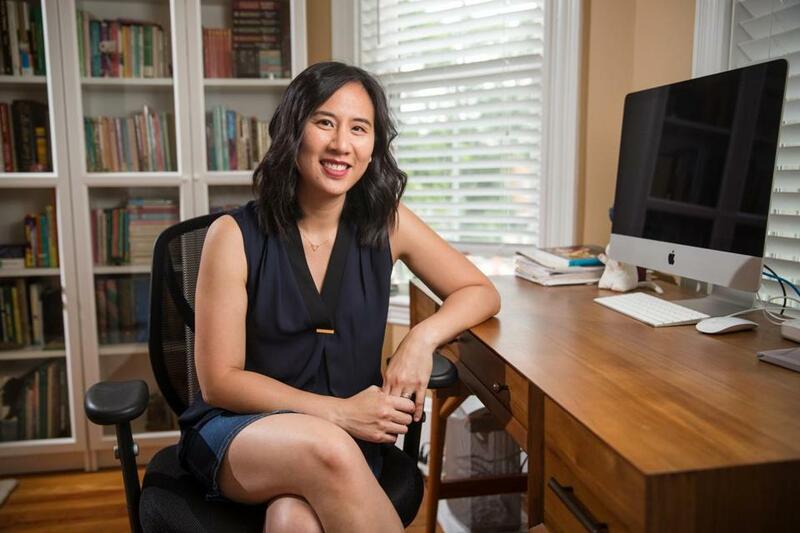 Cambridge author Celeste Ng, whose best-selling novel, “Little Fires Everywhere,’’ has been lighting up numerous best-book-of-the-year lists, is this year’s ambassador for the day. Papercuts JP will host a book launch for Leigh Belenger and also have guest booksellers, a raffle, and snacks. Porter Square Books is planning face-painting, a bake-off, Mad Libs, and more. Besides offering a selection of limited edition merchandise (literary tea towels, signed prints, bookish onesies), Harvard Book Store will collect love notes to bookstores. Laura van den Berg, Randy Susan Myers, Malindo Lo, and other authors will be at Belmont Books. For more information visit indiebookstoreday.com. Poet, writer, and literary translator Ani Gjika recalls poet Arthur Tze talking about the act of translation and searching for the “field of energy” in the original before trying to bring the words across the bridge into a new language. It’s how she approached translating Albanian poet Luljeta Lleshanaku’s work, “Negative Space,’’ coming out this week from New Directions. Gjika, who lives in Framingham, was born in Albania and moved to the States in the 1990s; her first poetry collection, “Bread on Running Water,’’ was published in 2013. “The translator needs to be sensitive to the possibilities of meaning that can arise through this inner compass language equips us with,” she writes in an e-mail. The collection has an urgent and original thrust, language that’s at once immediate and new: a black and white floor is “like a mouth of broken teeth, a baleen of darkness/sieving out new human destinies.” Gjika and Lleshanaku will read and discuss the work at the Grolier Poetry Book Shop on Friday, April 27 at 7 p.m.
Ann Hood (pictured) will be honored at this year’s Newburyport Literary Festival, which takes place Friday evening, April 27 and all day Saturday April 28 in various locations around Newburyport. She’ll be in conversation with Andre Dubus III on Friday evening, and a $50 Dinner with the Authors follows the talk. Saturday is dense with events: Alexandria Marzano-Lesnevich discusses her potent book “The Fact of a Body: A Murder and a Memoir’’ at 9 a.m.; Tom Perrotta talks about his latest novel of contemporary mores, “Mrs. Fletcher,’’ at 10:30 am; a panel on “Writing Hard Stories: Memoirists Who Shaped Art from Trauma” includes Alysia Abbott, Mark Doty, Dubus, and Melanie Brooks; poets Duy Doan and Jenna Le talk “Flair” at 1 p.m.; Rachel Kadish, Jessica Keener, and Steve Yarbrough discuss “Traveling Abroad: Novels Set in Distant Places” at 2:30 p.m. Christopher Irvin, Kate Christensen, Tova Mirvis, and many others will also read. For a complete schedule, visit newburyportliteraryfestival.org.